No images of Rush (I) have been located. As she was rebuilt as Rush (II), her appearance was probably similar. Type and Characteristics: Topsail schooner-rigged steam cutter, one of three Dexter-class with Dallas and Dexter, built by Atlantic Works, Boston, MA at cost of $79,800 for West Coast service, launched 14 March 1874, commissioned 21 July 1874, 179 tons displacement, 140ft long x 23ft beam x 8ft 10in draft, compound-expansion 400hp steam engine, one propeller, armed with 2-6pdr guns, crew of 40 - 7 officers and 33 enlisted. Log Period and Areas of Service: 1874-1884, Pacific coast of US, Alaskan waters. 14 July 1874 - Captain John A Henriques authorized to hire a crew. Ship commissioned on the 21st, and on the 27th, ordered to sail for New York to fit out for voyage to California. Sailed from New York on 15 September for San Francisco via Cape Horn. 8 January 1875 - Arrived in San Francisco. 1875 - Patrolled off California, Oregon, and Washington. 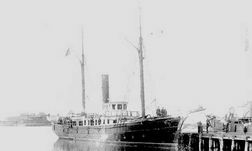 2 May 1877 - Made first Alaskan voyage, sailing via Wrangell, for Sitka, arriving on 19th. Departed Alaskan seas on 7 November for San Francisco. 19 July to 27 October 1878 - Second Alaskan voyage. 5 May until 20 October 1879 - Third voyage. 18 August to 1 November 1881 - Patrolled Alaskan waters and the Seal Islands. 1881-1885 - Remained on Port Townsend station. 24 February 1885 - Ordered to San Francisco to be rebuilt. Fate: Decommissioned 1885, started rebuild, original hull sold for $4,000 (other articles for $511.25) and replaced with new 175-foot hull.